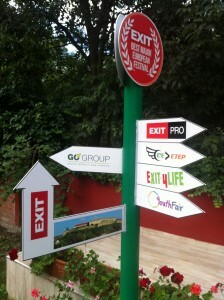 GO Group returned to EXIT – thanks for the great time! GO Group returned to the wonderful EXIT Festival in Novi Sad for another workshop on greener, smarter and more sustainable events. We had two great days at the Pavle Beljanski Memorial Collection in Novi Sad on July 10 and 11 2014 with international speakers, intense networking and that spectacular festival on top. For those who have missed it, EXIT was voted “best major festival 2013” at the European Festival Awards. We were able to meet so many great people during our time in Novi Sad: our participants, the CEETEP festivals and organisation team, the Danube festival network at EXIT pro and last but not least our wonderful hosts! Thanks a million to have us again. It was a blast! We are glad to offer this interactive, open and communicative workshop format at the conference going along with the musical spectacle and stimulate exchange, cooperation and inspiration – between event organizers, suppliers and all other parties involved in an event’s orginazation. Being there for the second time makes it a tradition already and we are looking forward to more and more years of GO Group and EXIT cooperations!